John’s sister Alice died just three months before her brother’s wedding, in 1807. How she had lived her fourteen short years I will never know, any more than I know what caused her untimely death. Neither can I prove for sure that James and Ann even were children of my x4 great grandparents, but I’ve not found another couple called John and Susanna Ridout in Sherborne. For some reason, the name Charles is always unlucky for me, genealogically speaking; such men in my family either die young or disappear without trace from the records. Unlike John, who I feel I know so well, his brother Charles is a complete mystery. He was baptised on 25th December 1787. There seems to be a division of opinion as to why couples married or had their children baptised on Christmas Day. Was it a family tradition or just a holiday when relatives were likely to have time off? Whatever the reason, Sarah followed suit in 1790, and then promptly ‘disappeared’. Charles seems to have stayed in town and married in the Abbey on 12th April 1815. His bride, Mary was, as I have said in an earlier post, the daughter of William and Mary Towers (neé Cottell). William was the editor of the Sherborne Mercury. 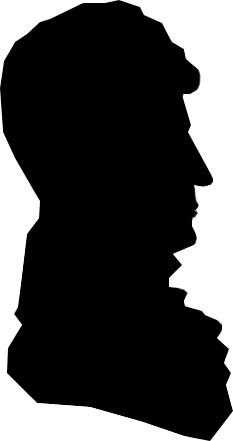 Mary’s brother William became a watchmaker in Wincanton and, according to the Bridgewater Advertiser, died aged 44, at his mother’s home in Sherborne on the 6th May 1833. Mary’s sister Ann appeared in the 1841 census as a patient at the Forston Lunatic Asylum in Charminster. At some point in their marriage, Charles and his wife moved to Bath because, ten years apart, this is where both of them died. The couple worshipped at the Argyle Independent Chapel in Grove Street, Bathwick (Congregationalist) and were buried at Snow Hill by the chapel’s most eminent divine The Reverend William Jay, who preached there from 1790 to 1853. So, I know the dates when Charles was ‘hatched matched and despatched’ but not a lot else. Maybe he was a man who worked with wood, like John, or maybe not. When Charles’ wife Mary died, in August 1822, the address recorded was ‘Oak Street’, a short road of terraced houses on the south side of the river. So, the couple were together seven years but I couldn’t find any suitable infant baptisms in the church registers of Sherborne or Bath. At the time of his own death in March 1832, Charles’ address was ‘Orange Court’, a small area of housing that had been behind the City Market, off Orange Grove. I was unable to find any evidence of Charles having paid rates in Bath but, given the number of rate books extant, this is still a work in progress. He is not recorded in the few existing early street or trade directories either but these tended mainly to record the nobility, professional classes and clergy, rather than the general populace. When one has very little, one clutches at straws. 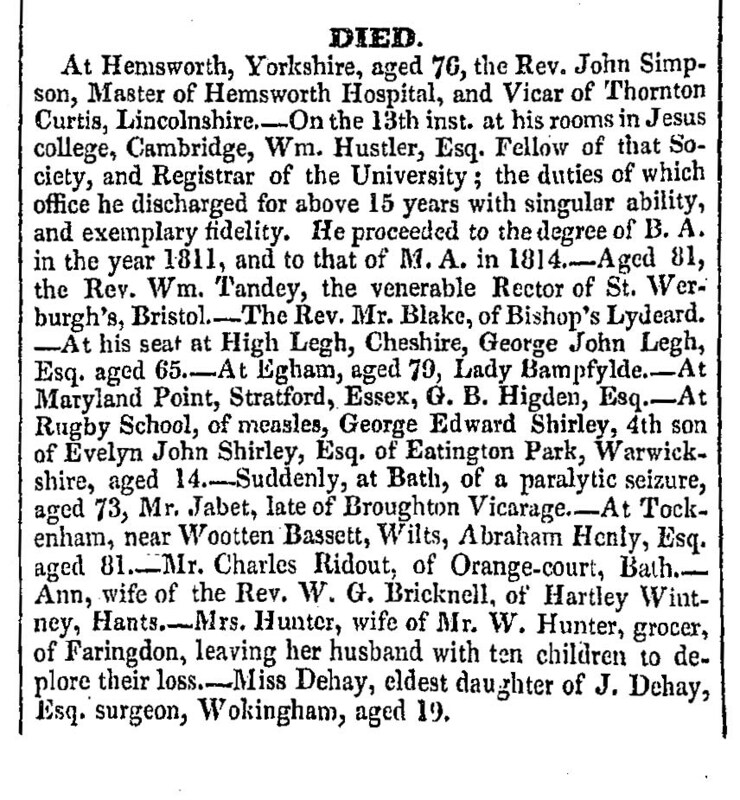 ‘Mr’ Charles Ridout’s death was reported in the local press, sitting amidst no fewer than three ‘Esquires’, one ‘Surgeon’, one ‘Lady’ and four ‘Reverends’. I choose to think that this means Charles was a gentleman! John Ridout’s younger brother Samuel, went to London at some point and married Elizabeth Radnor, a lady from Diddlebury, Shropshire. Rather mysteriously, the couple called the banns but then didn’t marry until two years later! Originally their wedding should have been within a very few days of 22nd December 1822, but it seems that they may not have turned up to the church on two of the three Sundays. Helpfully however, the pre-banns indicated that Samuel was lodging at 7 Portman Square and Elizabeth at 7 Little Ebury Street, both in what is now the London borough of Westminster. In 1824, the wedding finally took place at St Marylebone on 19th July. However, before he married, Samuel witnessed the marriage of John Arkill and Eliza Richards. In turn the newly married couple then witnessed Samuel and Elizabeth’s marriage. Were these just strangers helping one another out or did the parties know one another? Read on! Samuel and Elizabeth had their first two children baptised at St Marylebone: William was born at Edgware Road on the 30th April 1825 (baptised 3rd August) and George was born at Seymour Place on the 28th February 1828 (baptised 7th June). Although there have been UK censuses since 1801, most of them before 1841 are of little use to a family historian who wants names because they were more about collecting data such as the numbers of men, women and children or the different occupations in any one area. Fortunately though, Marylebone is one of the few districts in which the enumerator recorded names as well as numbers. In 1831, there was an entry: ‘Ridout’, ‘Brown Street, Marylebone’. Not much, but exciting all the same. Samuel didn’t make it to a trade directory until 1833 when Robson’s London Directory listed ‘Samuel Ridout, 22 Brown Street, Cheesemonger’. This came as a bit of a surprise because the children’s baptisms and 1841 and 1851 censuses suggested that Samuel had been a carpenter, joiner or builder. Why on earth was he a cheesemonger? Was this a mistake or was this another man? In a bit of lateral thinking, I searched for information on John Arkill. The London Gazette of 14th November 1834 recorded the details of the Court for Insolvent Debtors, held at 9am on the 8th December at Portugal Street, off the Tottenham Court Road: “John Arkill, late of No. 2, Tottenham-Street, Tottenham Court-Road, Middlesex, formerly a Cheesemonger, Pork-Butcher and French Polisher, and latterly a Dealer in Coals, Wood, Oysters, Butter, and Cheese”. So, is it a coincidence that John Arkill and Samuel Ridout had, at some point in their lives, both been cheesemongers? I think not. I think they were friends that day when they witnessed each other’s marriages and possibly even worked together for a while, in the 1830s perhaps. Samuel and his family moved to Dorking in Surrey where two more children were baptised together on the 5th July 1837 at the West Street Independent Chapel (Congregationalist) by the Reverend Richard Connebee: Alfred had been born in Marylebone on the 10th April 1831 and Alice had been born in St George’s Westminster on the 26th December 1834. So, for some reason, Samuel and Elizabeth had moved away from the established church and become non-conformists like both John and Charles Ridout. In due course, the family moved back to London where perhaps their descendants may live there still. The three boys all worked in the carpentry trade. Alice died unmarried in 1871. This entry was posted in Individual and tagged Argyle Independent Chapel, Bath, Charles RIDOUT, Congregationalist, Elizabeth RADNOR, Family history, Mary TOWERS, Samuel RIDOUT, West Street Independent Dorking, William TOWERS. Bookmark the permalink. I am researching the Towers Family esp William Towers and Mary Cotell. Would love to learn more about her daughter Mary and Husband, I can go forward with her Brothers line. I have a tree on Ancestry .Hope to hear from you.